Lumberjacking, even with power tools, demands a working knowledge of basic knots because there’s a lot of rope work involved. There aren’t many logging tasks that can’t be accomplished with lumberjacking knots, such as the square knot, bowline, slipknot, timber hitch or quick release. 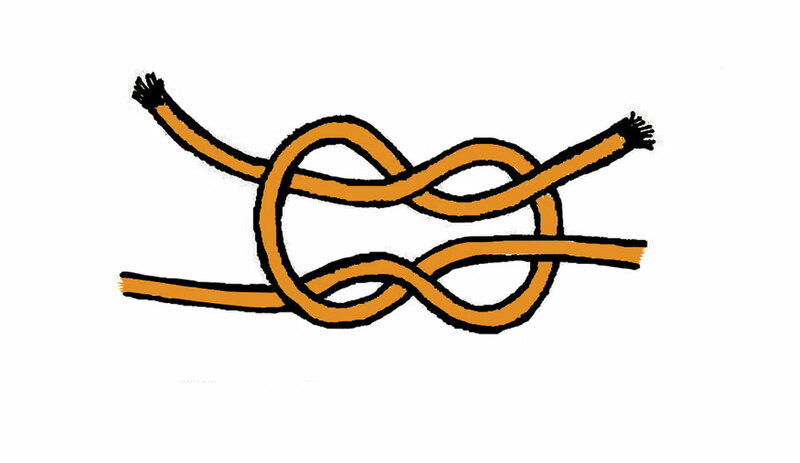 SQUARE KNOT: Everyone who can tie his or her shoes knows the square knot. Used to secure two rope ends to one another, a square knot is secure and usually easy to untie. The difference between it and a shoelace tie is that, with the latter, the final wrap is done with the laces doubled to enable the knot to untie with the pull of either free end. Note that if either wrap is crossed in the opposite direction, you’ll get a granny knot that is both unreliable and sometimes a bugger to untie. The square knot is often described through the use of metaphors about rabbits and holes, but I think the best way to memorize it is to tie it. BOWLINE: Sometimes you need a loop that won’t tighten. An overhand safety knot is preferred by firemen for hoisting someone to safety, it isn’t always possible to tie this knot around something. A bowline provides a loop that you can tie under your armpits, or step into, without having the loop constrict. And the bowline can be tied around a tree trunk. It’s also preferred for fashioning a loop that can be thrown over a piling at a dock or pier. SLIPKNOT: When it’s preferable to tie a loop that tightens when it’s pulled against, you need a slipknot. 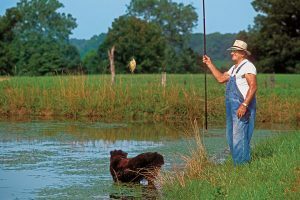 A slipknot is especially handy when tying off to a ball-type trailer hitch or similar object, because it constricts around the narrow part of the ball and won’t slip off. It can also be used to lower bags of cement or sand, is a must for any type of survival snare, and is the basis of an angler’s fishhook knot. A slipknot is the primary knot of a timber hitch. TIMBER HITCH: A timber hitch, or “choker,” is one of the most-used knots in logging. It allows a smooth- trunked tree to be dragged length- wise while preventing the rope tied around it from sliding free. It’s also a must for tying off hammocks to trees and raising or hauling lengths of pipe. Note that this is a combina- tion knot—a slipknot locked into place by a choker hitch, or two if necessary. A slipknot by itself can’t pull tightly enough to provide the necessary friction to hold, but add a choker and it becomes virtually impossible to move. 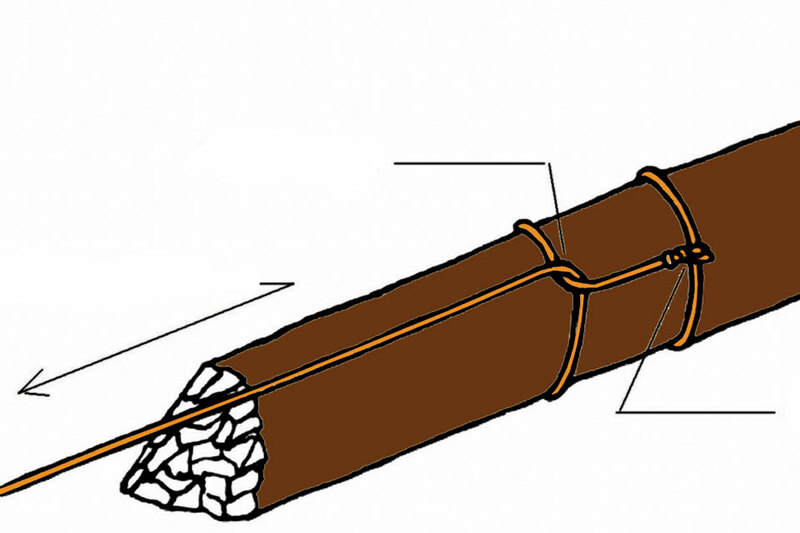 QUICK RELEASE: The ability to untie knots is important when lumberjacking because knots tend to pull very tight under the strain of a ton or more. Almost any knot can be made into a quick-release knot that comes untied with a pull of the loose end. Simply double the rope when making the last bend so that it forms a loop.